Collaboration doctor if signs of excess fluid appears to deteriorate. Monitor signs and symptoms of edema. Iron supplements are dietary supplements containing iron that can be prescribed by a doctor for a medical reason, or purchased from a vitamin shop, drug store etc. They are primarily used to treat anemia or other iron deficiencies. There are three ways that an iron supplement can be delivered: orally, intravenously or intramuscularly. This tablet is needed by pregnant women. Many women have an inadequate level of iron in their system to begin with, and the lack becomes more pronounced during pregnancy. Iron is very vital for the fetus; it is the only nutrient which the fetus depends totally on the mother for the supply. The average woman cannot depend on diet alone. The demand doubles during pregnancy and so iron supplements are added to compensate for the insufficiency. Iron-deficiency anemia during pregnancy is linked to an increased risk of preterm delivery and low birth weight. It's also associated with a higher risk of stillbirth or newborn death, so it's something to take seriously. There are two types of iron, heme and nonheme iron, categorized this way because the former is derived from meat and the other from non-meat sources. Heme iron is more readily absorbed than nonheme iron. Signs and symptoms of iron deficiency may include brittle nails, swelling or soreness of the tongue, cracks in the sides of the mouth, an enlarged spleen, and frequent infections. People who have iron-deficiency anemia may have an unusual craving for nonfood items, such as ice, dirt, paint, or starch. This craving is called pica (PI-ka or PE-ka). Some people who have iron-deficiency anemia develop restless legs syndrome (RLS). RLS is a disorder that causes a strong urge to move the legs. This urge to move often occurs with strange and unpleasant feelings in the legs. People who have RLS often have a hard time sleeping. Within a week or so after starting treatment, you should be producing a lot of new red blood cells and your hemoglobin level will begin to rise. It usually takes just a couple of months for the anemia to resolve, but your caregiver will likely advise you to continue taking iron supplements for several more months so you can replenish your iron stores. One more important thing to note: Be vigilant about keeping any pills containing iron in childproof containers and away from children. More kids die from iron overdose each year than from any other kind of accidental drug poisoning. In fact, a single adult dose can poison a small child. Take your prenatal vitamin and eat a healthy diet that includes plenty of iron-rich foods. Red meat is your best bet, although poultry (dark meat), other meats, and shellfish are good sources, too. Non-animal iron-rich foods include beans, lentils, tofu, raisins, dates, prunes, figs, apricots, potatoes (leave the skin on), broccoli, beets, leafy green vegetables, whole grain breads, nuts and seeds, blackstrap molasses, oatmeal, and iron-fortified cereals. Keep in mind that your body absorbs the iron from animal sources (heme iron) much more readily than the iron from non-animal sources (non-heme iron). The word hepatitis comes from the Ancient Greek word hepar (root word hepat) meaning 'liver', and the Latin itis meaning inflammation. 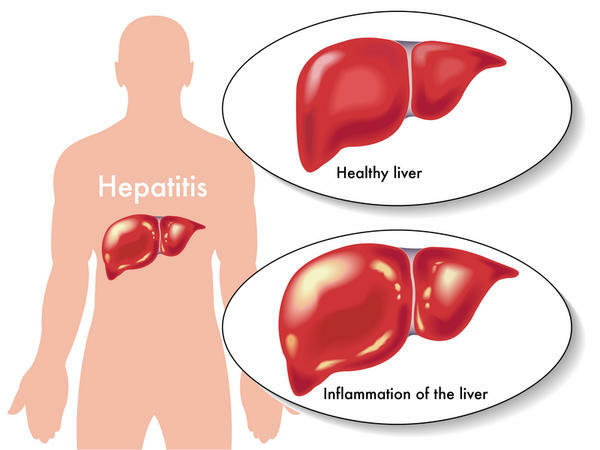 Hepatitis is a term used to describe inflammation (swelling) of the liver. It can occur as a result of a viral infection or because the liver is exposed to harmful substances such as alcohol. Most liver damage is caused by 3 hepatitis viruses, called hepatitis A, B and C. However, hepatitis can also be caused by alcohol and some other toxins and infections, as well as from our own autoimmune process (the body attacks itself). All meals are high in fat like mutton and pork, offal, brains, ice cream, whole milk, cheese, butter / margarine, coconut oil and foods like goulash. Canned food such as sardines and korned. Cake or fatty snacks, such as cake, fried foods, fast food. Raw foods that cause gas, such as sweet potatoes, beans, cabbage, radishes, cucumbers, durian, jackfruit. Stimulating condiments, such as chili, onion, pepper, vinegar, ginger. Beverages containing alcohol and soda. Source of carbohydrate, such as rice, oatmeal, white bread, tubers. Sources of protein include eggs, fish, meat, chicken, tempeh, tofu, green beans, vegetables and fruits that do not cause gas. Foods that contain high carbohydrate and easy to digest such as confectionery, fruit juice, jam, syrup, preserves, and honey. Angina pectoris is the medical term for chest pain or discomfort due to coronary heart disease. It occurs when the heart muscle doesn't get as much anginablood as it needs. This usually happens because one or more of the heart's arteries is narrowed or blocked, also called ischemia. Angina often occurs when the heart muscle itself needs more blood than it is getting, for example, during times of physical activity or strong emotions. aching across the chest, particularly behind the breastbone. People with angina pectoris or sometimes referred to as stable angina have episodes of chest discomfort that are usually predictable and manageable. You might experience it while running or if you’re dealing with stress. Normally this type of chest discomfort is relieved with rest, nitroglycerin or both. Nitroglycerin relaxes the coronary arteries and other blood vessels, reducing the amount of blood that returns to the heart and easing the heart's workload. By relaxing the coronary arteries, it increases the heart's blood supply. If you experience chest discomfort, be sure and visit your doctor for a complete evaluation and, possibly, tests. If you have stable angina and start getting chest pain more easily and more often, see your doctor immediately as you may be experiencing early signs of unstable angina. 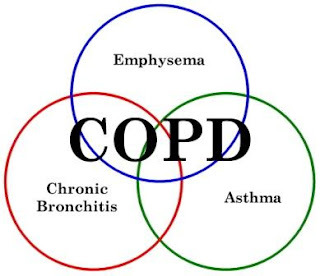 Chronic obstructive pulmonary disease (COPD) also known as emphysema and chronic bronchitis is a very serious disease. COPD is one of the most common lung diseases. Goal : Ventilation / oxygenation to the needs of clients. 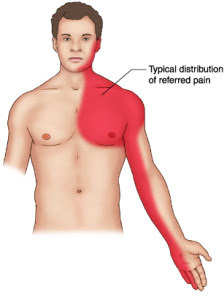 Assess the patient to a comfortable position, such as raising the head of the bed, seat and backrest of the bed. Review / monitor respiratory frequency, record the ratio of inspiration / expiration. Auscultation for breath sounds, record the sound of breath for example: wheezing, and rhonchi krokels. Observation of the characteristic cough, for example: persistent, hacking cough, wet, auxiliary measures to improve the effectiveness of the airway. 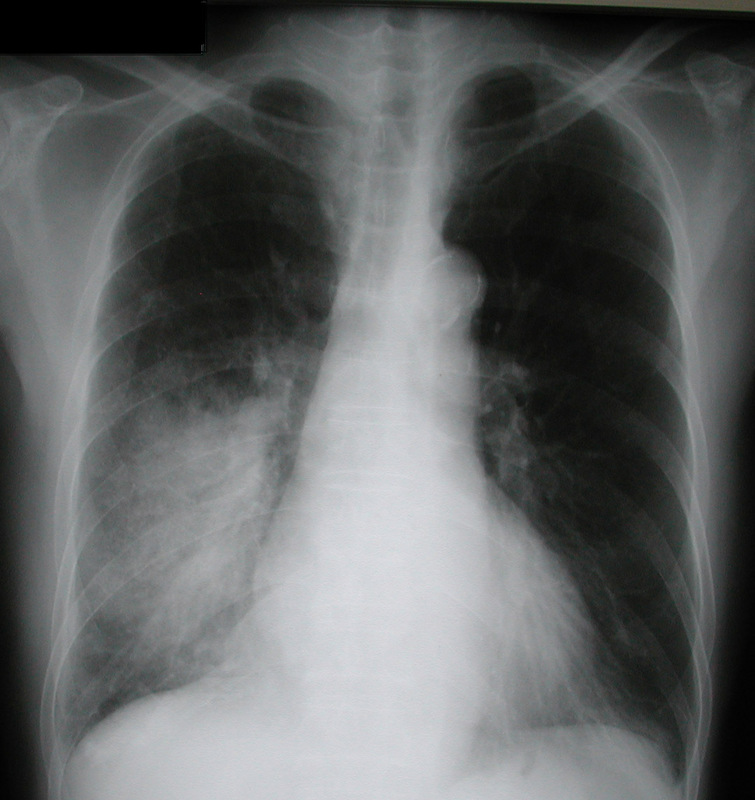 Note the presence disepnea, for example: complaints restlessness, anxiety, respiratory distress. Help the abdominal breathing exercises or lip. Bronchodilators, eg, β-agonists, efinefrin (adrenaline, vavonefrin), albuterol (Proventil, Ventolin), terbutaline (brethine, brethaire), isoeetrain (brokosol, bronkometer). Increase fluid intake to 3000 ml / day according to tolerance of the heart. Risk for Infection related to inadequate secondary defenses (decreased hemoglobin, leukopenia, or a decrease in granulocytes (inflammatory response depressed)). 1. Maintain strict aseptic technique on the procedure / treatment of wounds. 2. Increase good hand washing; by the care givers and patients. Rational: to prevent cross contamination / bacterial colonization. .3. Give skin care, oral and perianal carefully. 4. Increase enter adequate fluids. Rational: to assist in the dilution secret breathing to ease spending and prevent stasis of body fluids such as respiratory and kidney. 5. Motivation changes in position / ambulation often, coughing and deep breathing exercises. 6. Monitor body temperature. Note the chills and tachycardia with or without fever. 7. Monitor / limit visitors. Provide insulation where possible. Rational: limiting exposure to bacteria / infection. Protection of insulation required in aplastic anemia, when the immune response is very disturbed. Rational: indicators of local infection. Note: the formation of pus may not exist when granulocytes depressed. Rational: may be used to reduce colonization or prophylactic treatment for local infection process. There is a specific gene, which if present in the patient’s genetic make up, can result in the development of otosclerosis. Some medical studies have implicated the measles virus as a factor in causing otosclerosis. In some women with otosclerosis, pregnancy can accelerate the process. There is no known cure for otosclerosis. The individual with otosclerosis has several options: do nothing, be fitted with hearing aids, or surgery. No treatment is needed if the hearing impairment is mild. Hearing aids amplify sounds so that the user can hear better. The advantage of hearing aids is that they carry no risk to the patient. An audiologist can discuss the various types of hearing aids available and make a recommendation based on the specific needs of an individual. As hearing aids work well and are completely safe, many patients with otosclerosis decide not to undergo surgery. 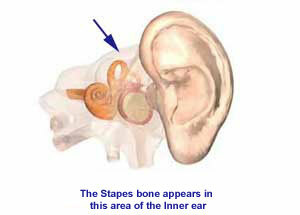 However, surgery does offer the chance of returning the hearing to normal so that a hearing aid is not required. Surgery can also have a stabilising effect on the otosclerotic process and can offer some degree of protection against otosclerosis advancing to the inner ear.